NOL • Bihari László • 2007. január 4. Slavoj Zizek korábbi szövegei a MANARCHÍVBAN!! 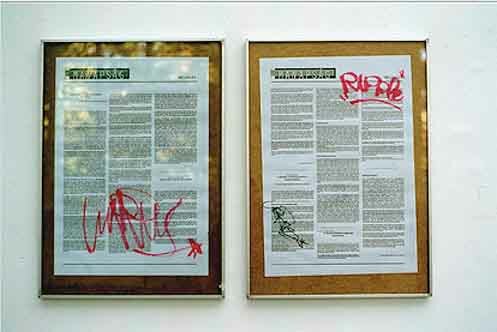 In view of our social environment we sought to develop a paper that directly connects the art-scene to the domains of civilian activity and political activism. This intention took up Tibor Várnagy's forerunner Manapság (Nowadays). Ultimately Manamana was instigated by the exhibition Service (Műcsarnok / Kunsthalle Budapest) which motivated us to develop our project concretely. The call for entries of the show had encouraged artistic projects that could function as public services. 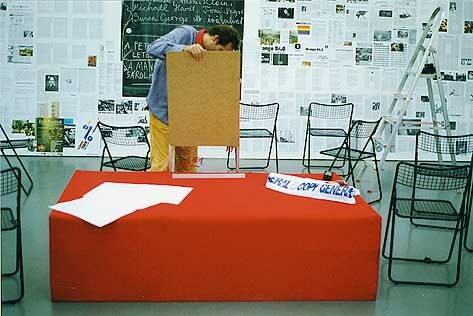 Judit Angel's curatorial concept provided the opportunity to react to the politically and socially sterile atmosphere of most of the Hungarian art scene. 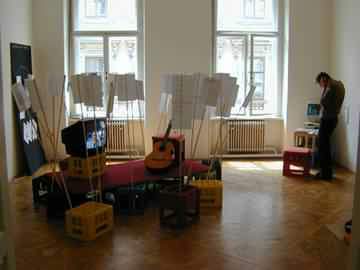 This atmosphere exists very generally, not only among artists, but also in the attitude of the broad public in Hungary. It is characterised by a "sophisticated understanding" of contemporary political, economic and social realities, without drawing the slightest practical conclusion of this understanding. Manamana was born in the time when Hungarian journalism and other public media - and, as a possible consequence, the public awareness of the country - lived its darkest days. Except for the strong, extreme right-wing opposition, no dissident press existed. Beyond irrelevant illustrations of pseudo-struggles between national political parties, no reflection appeared in the press displaying, and commenting, on the international situation. There were no demonstrations except for small ones that attracted marginal numbers of people. Today, with Hungary joining the EU, the situation has been slightly improved. The EU membership requires the presence of a stronger network of non-governmental organisations (NGOs) and the appearance of an (in some cases pseudo) alternative thinking in the political spectrum. Since then many independent organisations started their activity in Hungary. Before this, we could only refer to foreign examples at the time of the first Manamana (e.g. Attac, Indymedia, Greenpeace, etcetera). Due to the relatively broad response (also from outside the art-scene), we think that the Manamana project succeeded to contribute to the formation of a network of different groups of people engaged in independent activities and, not the least, to open up new channels of communication between different social groups and the contemporary art scene. The next public presentation of Manamana will take place at the Budapest part of the exhibition series Balkan Consulate at Rotor, Graz, in July 2003. Beyond presenting informational material, we (Tibor Várnagy, Miklós Erhardt, Dominic Hislop, Andreas Fogarasi, in collaboration with as large a pool of people as possible) are planning radio programs. They are to be made in collaboration with an independent local radio station in Graz. Contributions on: the phenomenon of corporate globalization, different Hungarian NGOs, artistic practices dealing with social and political themes from the international scene, excerpts from block-buster books unavailable in Hungarian (e. g. Empire or No Logo) and other unedited translations from the international dissident press, reacting to events like the G8 summit in Geneva or the September 11th bombings (credits to: Noam Chomsky, Naomi Klein, Michael Hardt / Toni Negri, Robert Fisk, Starhawk, Arundhati Roy, Bifo and others). Published as part of the project Klímaszerviz (installation of articles, flyers, manifestos, etcetera, pinned up day by day, open discussions without entrance fee to the gallery, publication of the paper) by Tibor Várnagy, Miklós Erhardt, Dominic Hislop, Viola Ferjentsik, Andreas Fogarasi and others, at the exhibition Szerviz, Műcsarnok 2001. Published as part of the exhibition Budapest Box, Museum Ludwig Budapest 2002 (Manamana III) and as part of the project Manafest, Műcsarnok / Kunsthalle Budapest 2002 (Manamana IV). Manafest included weekly panel discussions on public art, art and activism, work as social concept and alternatives to capitalism. Since then the project goes further on-line, accessible through the web site of Liget Galéria at www.ligetgaleria.c3.hu (see also www.indymedia.hu).